High quality round tablecloths and rectangular table linens in satin, polyester, crinkle taffeta, pintuck taffeta, pinwheel pinched taffeta, lamour, and spandex create hotel and restaurant standard tablecloths that can thrive in professional laundering and retail settings. As a premier wholesale tablecloth supplier, we carry tablecloths for 5 ft round tables, table linens for 6 ft round tables as well as floor-length table cloths for 6 ft rectangular tables and table drapes for 8 ft long tables. Investing in tablecloths can be one of the most profitable decisions you can make for your business. Since 2008, we've been helping restaurants, hotels, party rental companies and wedding professionals determine the best inventory choices for their linen requirements. We continue to offer the same professional quality and we also keep on expanding our tablecloth collection to help you stay ahead of the trends and attract more customers. To create tablescapes, use table cloths along with cloth napkins , table runners and overlays. How to start your table linen shopping or how to decide on where to buy tablecloths online? The best advice we can offer is to buy your event or wedding tablecloths from a B2B table linen supplier or a wholesale chair cover and tablecloth company such as Your Chair Covers. 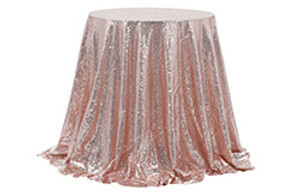 As a preferred table linen supplier of hotels, restaurants, banquet centers, party rental companies, catering service businesses and wedding reception halls, we have become a go-to resource not only because of the price we offer but also due to the commercial grade or quality that our tablecloths and other linens have been known for. Whether you're looking for discount tablecloths or wholesale tablecloths, our huge selection of round tablecloths, rectangle tablecloths and unique tablecloths should be able to meet the table linen requirements of your business. 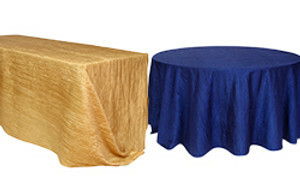 If you are a hospitality business owner, why rent table linens when you can buy tablecloths for less? 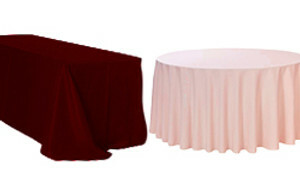 Why call a table drape for hire when you can order table cloths at discount, wholesale prices? If you are in Los Angeles County and Orange County in California, you are welcome to stop by at our corporate office and warehousing facility in Sun Valley. We are offering pick-up options (will call) for Greater Los Angeles, San Diego, Orange County and downtown LA linen shoppers. We recommend placing the order online then select "Local Pick Up" as shipping method at checkout. If you prefer to place the order over the phone, we can do that for you too! To be more efficient, just give us a call at least an hour before your intended pick-up time.